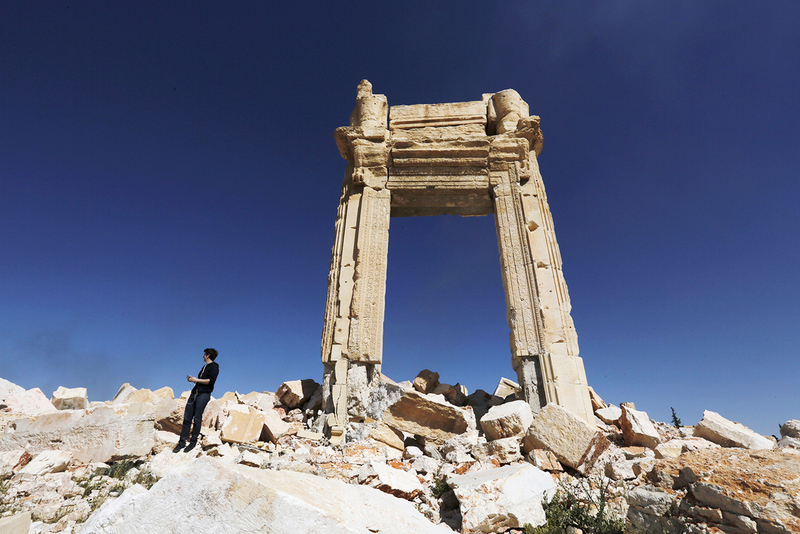 A journalist stands at the remains of the Temple of Bel in the historic city of Palmyra, in Homs Governorate, Syria. The Syrian army continues its offensive on Palmyra with the support of the Russian air task force, Russia’s Defense Ministry reported on Feb. 13. "The Syrian government troops are continuing their offensive towards Palmyra with the support of Russia’s aviation. A distance of less than 20 km remains to be covered. Over the past week, Russian warplanes have conducted over 90 sorties in the Palmyra direction," the Defense Ministry said in a statement obtained by TASS. In the course of their offensive, the Syrian government troops have destroyed over 180 militants’ objectives, including more than 60 strongholds, 15 depots with armaments, munitions and military hardware, 43 armored fighting vehicles, and also jeeps armed with large-caliber machine guns, the statement said. "The terrorists’ losses in manpower have amounted to over 200 men," the ministry said. According to data of Russia’s Defense Ministry, the Syrian government troops have established control of a territory of 22 square kilometers since Feb. 7 and liberated the communities of al-Kulaib and Kirkuk and the surrounding dominant terrain. "Overall, the Syrian government troops have liberated 805 square kilometers of the territory in the province of Homs from terrorists of the ISIS since they launched their operation with the support of the Russian air task force," the ministry said.